The ‘Social Enterprise Means Business With Purpose’ Masterclass Series continued in October with a session entitled ‘Commercial v Social Aims: Striking The Balance’. David was one of the Founders of Social Spider in 2003. He supports, researches and writes about social enterprise and social innovation, specialising in social enterprise development and social investment. He has written for The Guardian, The Young Foundation and The Pioneers Post and has lectured on social enterprise at Goldsmiths College, Middlesex University and University of the West of England. David is a Non-Executive Director of Significant Seams CIC, a social enterprise which nurtures self-confidence and community, through textile crafts and traditions. Based in London, he is also a Non-Executive Director of Inpress, the sales and marketing agency for independent publishers in the UK and a member of the Governing Council of Social Enterprise UK. Drawing upon his own research and work in this field David will explore the ‘Commercial v Social Balance’. As Trust Director of The Resurgam Community Development Trust, Adrian oversees the operations of six companies which comprise a total of ten trading, community-based social enterprises. These include an Enterprise Centre, a Community Gym, a Public House / Off-Sales, a Self-Build Company, a Credit Union, a Contract Services Provider, a Taxi Company, a Thrift Shop, a Property Management Company and a Business Services Provider. Adrian has worked in regeneration for some 20 years, chairing both South Eastern Social Investment Fund and Early Intervention Lisburn steering groups. Reflecting on his own experiences he will offer his insight into how to achieve the right ‘Social v Financial’ balance. Ken has served as President of the International Council for Small Business, Board member of the UK’s CBI SME Council, and Chairman of Young Enterprise in NI. He was the first person to be awarded The Queens Award for Enterprise Promotion and his most recent book ‘Understanding Enterprise’ (co-authored with Simon Bridge) was recently shortlisted for CMI’s Business Book of the Year. 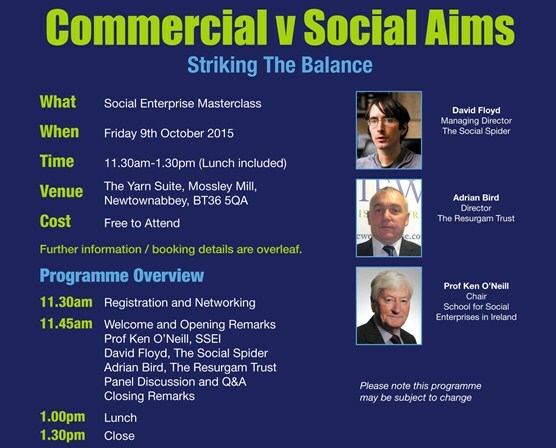 Ken will chair the event and share his own thinking on the ‘social’ and ‘enterprise’ balance.